So, you have a blog now. What you need to have next is a logo. Having a logo is a part of your blog branding. And since the logo is the face of your blog so having a good logo is important for your blog. Today I’m going to share you a tutorial on how to create a “professional look” logo with PicMonkey. This is a low-budget solution if you don’t want to buy a logo design which will cost you quite a fortune. What you need is subscription plan to PicMonkey, fonts you can download for free or buy and images as background if you want to have one. Now probably you don’t understand what a hub space is. 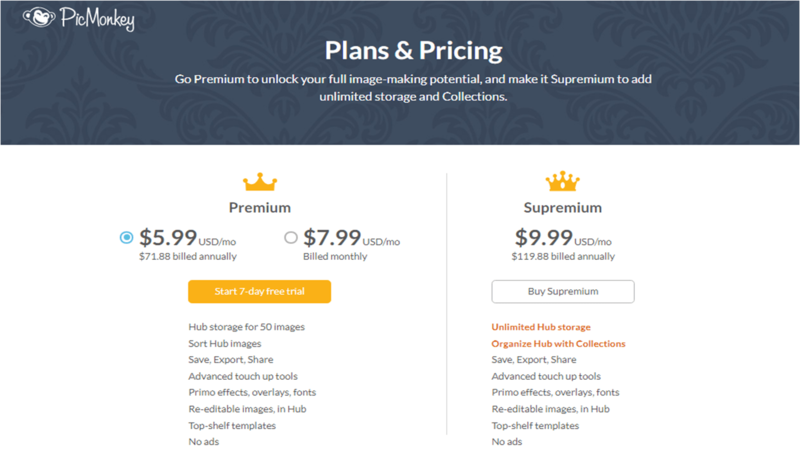 It is a place where you can store your image without having to edit over and over again. This makes designing easy for you. As you can see at the picture, you’ll only get Hub Space limited to 50 images if you subscribe to Premium Plan. Based on my experience it is better to subscribe to Supremium Plan because you don’t have to delete every time the Hub is full. It’s super convenient. For me, PicMonkey is easy to use and you don’t have to know the technical design stuff. They even provide templates for you to follow in many sizes for Pinterest, Facebook, Twitter and even Instagram. Now, enough of me explaining about PicMonkey, Let’s start the tutorials! #3 Choose a size or template. You can create custom by inserting the size (in pixels) on the top right. I’m going to guide you for a simple logo without background and later I will show you how to add a background. Anyways, if you want to create a custom size then the logo size is 1700×466 pixels. Click apply for now because we need a white background to design. #4 To create a simple logo with wording only. You can directly go to Text (Tt ) on the button on the left bar. Now you have 2 options, whether you use PicMonkey’s font (OURS Tab) or you can go to YOURS tab if you already have the font you want. Here, I’m going to use a handwritten font “Annisa” for my logo then add text or you can see a post for a Complete Guide to Font Pairings for Lifestyle Blog to see other font options. Type your logo text and then adjust the size. To place the logo in the middle, choose the tab down below based on order. Number 2 tab will show what element you already put. And number 4 tab will appear for every element you click to which you can change colours, the transparency (Fade), sizes and many more. Note: When you think that the white background is too big for you to see, you can adjust it by scrolling up and down so you will see well. #5 Last one, choose Basic Edits and choose transparent canvas colour so it will follow your blog background. Save to Hub for later editing or you can export to save it on your computer. And voila! You finish your logo! You can also create a “professional look” logo for your blog. The one with a background and it requires an advanced editing skill. Nah, I’m joking. You can obviously do it with PicMonkey. One good source to find a free background is Free Design Resources. You can get textures and pattern to use for your logo. Note: Textures and patterns are often used as a background for your font. Let’s say I want to make my logo with a gold texture and images. What you need to do is download these textures pack then unzip it. Next, you need to find a background you want via Google, one thing you need to note that the file must be in JPG, JPEG or PNG. Or you can check out these freebies that I found cute! After that, let’s go back to PicMonkey again and change the canvas colour to white. 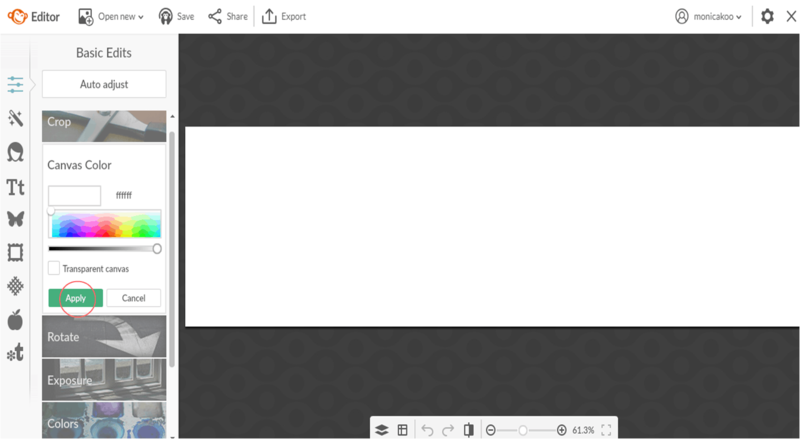 Insert the background picture via Overlays button and enlarge it ( I use blog headers from InkStruck). On the Layers tab, you can push the background to the behind of the font. Then add the gold textures via left Overlays button and enlarge it. Lastly, this is the most important part. You need to go to the Overlays tab and choose to Add on the Blend modes. Note: Remember the order should be like this so you can overlay it right. And that’s it! You get a very pretty logo header for your blog! Save it to Hub or you can export it directly. This is why I love using PicMonkey to design everything I need for my blog. You’ll definitely won’t regret to subscribe to PicMonkey. You can sign up through my link HERE. Hope this tutorial can help you to build a beautiful professional “look” logo for your blog. Leave me a comment below if you have tried to do this tutorial and what do you think? 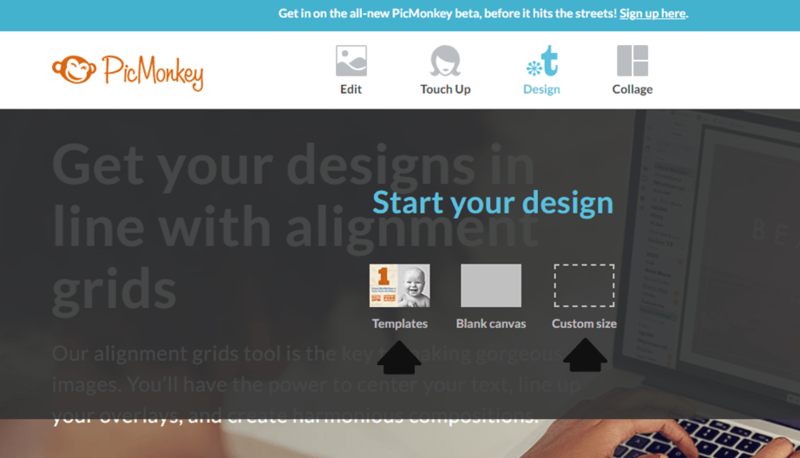 is PicMonkey easy to use?